Poorly aligned teeth? Think it takes forever for braces to straighten them? Think again. 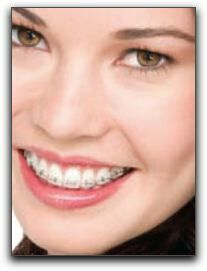 There are many new types of braces available at your San Antonio cosmetic dentist‘s office. In some cases, teeth can be straightened in a few months and then, with braces off–a fantastic new smile. If you are considering straightening your teeth, come into William J. Stewart Jr. DDS in San Antonio for an orthodontic consultation. We can discuss the new types of braces. Dr. William Stewart, DDS, will explain the pros and cons of each type and recommend the most effective (and quickest!) system for your teeth. The first things most adult San Antonio teeth-straightening clients ask about are the newer systems, sometimes called clear braces and adults braces. Clear Correct is a brand name of an alternative orthodontic system popular in Shavano Park and Leon Springs. Many of our adult orthodontic patients have been embarrassed by their crooked teeth for many years and have developed a habit of covering their mouth when they smile. It is great to see them smiling confidently after they have completed treatment. Younger clients usually have a different attitude about braces. They seem to consider braces more like a fashion accessory and are not afraid to show them off. San Antonio area teens are interested in color braces and colored rubber bands braces. During orthodontic consultations, they usually ask about the possibility of a clear retainer to maintain teeth alignment after their braces have done their job.